Salubriously situated between the ‘Paris’ and the ‘London’ symphonies, Haydn’s 90th symphony (1788) in 1788, uses lively writing with playful changes of tempo and brilliance of form to create surprises, as well as more straightforward melodic satisfactions. After the weighty Shostakovich on Saturday evening in the Koussevitzky Shed, it was a pleasant contrast on Sunday afternoon that the BSO opened with music of a generally more whimsical nature, with lighter scoring, much simpler winds, and reduced strings. Andris Nelsons was masterful in realizing this contrasting sound world, while losing none of his trademark flair and broad sweep. The gestures from Nelsons were no less dramatic than in his Shostakovich on Saturday evening, but all was placed at genteel service of Haydn’s elegance. The BSO seemed to revel in the phrasing, and to be fully lively to the conductor’s attention. We were treated to some amazing solo winds this weekend; both Keisuke Wakao (Assistant Principal Oboe) and Elizabeth Rowe (Principal Flute) were again utterly convincing in the Haydn. There had been times in the Shostakovich on Saturday evening when the flute solos had been a match for the brass in volume and projection, but here a liquid gold characterized the tone. Nuanced ensemble-work from the whole orchestra brought horns to the fore during the first movement. The second movement was wafted by a very slight breeze—almost imperceptible but very much in sympathy with this lilting F-major Andante. Long expressive upbeats, variously weighted and lengthened, made for an extremely elegant reading and a pleasant character of naturalness and attention. The F minor sections, while rather deep and thoughtful in effect, never threatened to ruffle the overall calm of this delightful set of variations, which grow sprightlier before scattering. The only slightly unconvincing moment of the whole afternoon came in the string solos of the second movement, when the intonation and ensemble was not such a success as one might have expected. Also, the serene atmosphere was somewhat dissipated by the enthusiastic and rather self-congratulatory applause from some concert-goers following each movement, which made one wonder whether certain of the audience were expressing willful disregard of the symphonic form (rather than more sympathetic unfamiliarity and forgetfulness of self). The Minuet was rhythmic and dance-like, with many audience members unwittingly swaying in unconscious imitation of Nelsons, who was most mobile on the podium; his occasional side-step betrayed an urge to frolic. Shimmering flute arabesques were conducted with fingers that cast a magical glitter. An especially lovely moment came in one of the structural repeats, when the oboe soloist changed tone and volume and imperceptibly broadened the tempo most expressively. The final Allegro Assai had a feeling of a cheerful vessel homeward bound; the tempo was easeful but had an energetic momentum, which meant that the famous joke was all the more effective. The mock ending in the home key resulted in tumultuous applause; based on the previous applause mid-symphony, it was as if Haydn had this audience in mind as being especially prone to such japes! Nelsons allowed this to continue for quite a while (more than Haydn’s scored 4 measures) with a wide grin and a gesture of mock forgetfulness (oh! Silly BSO! We forgot the last page!) before determining that enough was enough and resuming in the flat supertonic major. The true ending brought a great storm of enthusiasm as befitted such a poised reading. Brett Dean’s work for trumpet and orchestra was commissioned for the great virtuoso Håkan Hardenberger, who performed it with great precision and commitment. The piece has a main ‘character’ (played by the trumpet) and charts some of his interactions with society (the orchestra), and the drama those dynamics create. The different contexts show different ‘personae’ of the same character. In the first movement, the protagonist is a ‘Superhero’ who is influenced by classical notions of heroism, but also the gaudy world of comic strip and cartoon; ultimately, he is defeated, yet the score revels in the heroic and mock-heroic. Dean’s palette is extremely nuanced, painting some arresting sonic-scapes; many were the novel and surprising effects. In the opening percussion, there was a Nintendo-esque use of tuned blocks and flippant fragments; viola and cello tremolandos created a very realistic ‘electronica’ sonority. The climax of the movement created the sound of a Silvestri score dopplering in and out of post-modern urban chaos. The impressive rhythmic complexity characterized the struggle of the hero; at times, he is barely dodging the buffets of the world. The second section, a Soliloquy, was more introspective and self-aware, dominated by a miserable, exhausting passage in which the flutes execute micro-tonal descending scales, as if the batteries were running down; meanwhile, the basses thunder with quiet menace. The first movement was about daring and defiant tragic heroism; here we heard vulnerability and self-doubt. 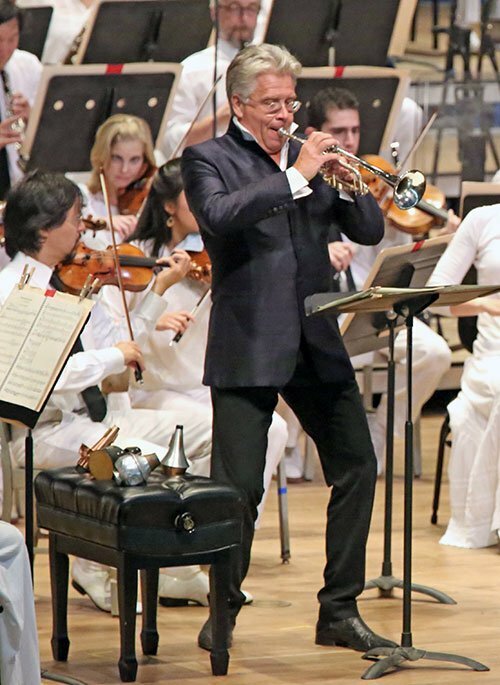 Hardenberger offered sensitive communication and masterful intonation and dynamic range; he truly made the trumpet sing with great pathos and humanity, the very opposite of unyielding fanfare. The final movement, inspired by Charlie Chaplain’s Modern Times, explores the comedy of unsought leadership and heroism. Hardenberger changed mutes numerous times, like a brass Batman with his accoutrements; likewise, a mid-movement change in position to the corps of the brass, with the soloist descanting in dissonance over an ever-approaching militaristic parade, communicated the struggle of maintaining individualism in the face of conformity (a concern most evocative of Saturday’s Shostakovich), and the fearful possibility of being trampled in the onslaught. Throughout the piece, the soloist made much use of snares; towards the end an amazing duet occurs between spatially separated snared trumpets—a truly striking moment, as the buzzing and snarling belie a very tuneful and tonal approach. Clicking percussion creates an effect of surrealism and disorientation. A massive crescendo leads to a climax from which an almost irritatingly simple diatonic melody is taken up amidst more hallucinogenic sonic effects from all corners. It was a fascinating experience, which would no doubt be enriched by repeated hearings. Hardenberger’s verve and swagger and Nelson’s direction seemed wholly in sympathy; such palpable affinity conveyed a redeeming sense of the human dignity of Art as rebellion against the lethal automaton. On an afternoon already beguiled by crazy stories, Richard Strauss’s Don Quixote, Op. 35, Romance in F Major for cello, viola and large orchestra (Phantastische Variationen über ein Thema ritterlichen Charakters or Fantastic Variations on a Theme of Knightly Character), emphatically marked the 400th anniversary of the publication of the second part of Cervantes’s novel. The chaotic narrative lends itself excellently to the composer’s expressionistic and wild imaginings. Ma Ansell, and Nelsons went well beyond the merely virtuosic, with many moments of supreme repose, lyricism and tenderness. Equally, overpoweringly intense effects of cacophony, volume, and grotesquery abound; Nelsons conducted some of the orchestral pizzicato chords deliberately judderingly to deliberately less exact and heavier effect, the wind machine roared wildly, and herds of violent sheep were depicted by fluttering trumpets. 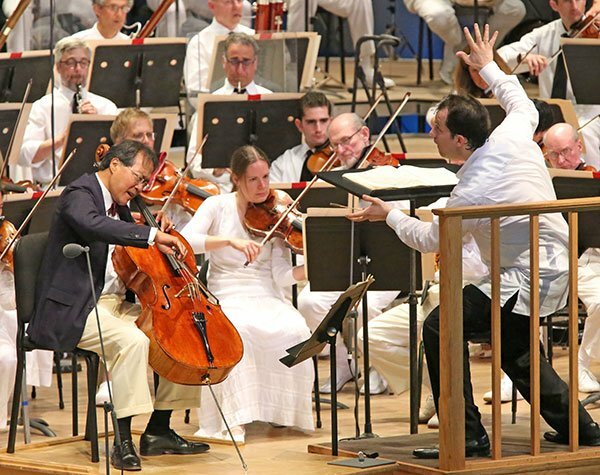 Yo-Yo Ma arrived on stage to huge acclaim. His every glance and interaction with the players and conductor felt congenial and celebratory, right from his warm and affectionate greeting of Steven Ansell (principal viola and soloist). Ma’s incredibly expressive approach seems to chime perfectly with Andris Nelsons, and they sparked off one another. Steven Ansell gave a first rate account of the involved viola part, tumbling through the complex runs with great nimbleness, never losing richness of tone. This is one of the few works where the sometimes retiring instrument really gets to shine, and a great case was made for it. Both Ansell and concertmaster Malcolm Lowe had great chemistry on stage with Ma, who visibly involved the other soloists in the performance. The audience dispersed, rudely returned to reality, but with the vestigial glow of the dreams from which they had not quite awakened. With great joy I read of the significant extension of Andris Nelsons’s contract with the BSO. This is surely a recipe for truly great things.